*"*See Exhibitor Info tab located at bottom of website. The Art Providence Holiday Show was created in 2017 to (a) replace the Rhode Island School of Design’s holiday show after its successful 20-year run, (b) broaden the show to include other talented artists alongside RISD alumni artists and (c) become one of the premiere arts and crafts events in New England. Considered the birthplace of the Industrial Revolution in America, Providence has a long, rich history of creating and making. Known more recently as the Creative Capital, it is home to the Rhode Island School of Design, Brown University, and other premiere academic institutions – all of which enrich the city’s creative community and cement its reputation as one of the crown jewels of art, design, and making in the US. Providence is also a vibrant yet accessible city in terms of restaurants, nightlife and live entertainment. It is becoming increasingly popular as a weekend getaway destination. We can think of no better c ity in which to celebrate and promote the work of artists and artisans than art-and-design savvy Providence. *Artists will be assigned specific load-in times. A qualified panel of jurors is assembled each year to select artists making superlative work in baskets, ceramics, decorative fiber, wearable fiber, drawing, furniture, glass, graphics, jewelry, leather, metal, mixed media, painting, paper, photography, printmaking, sculpture and wood. All images will be viewed using computer monitors. Applicants will be notified of jury selections on Juried Art Services and via email shortly after the completion of the jury process. Waitlisted exhibitors are queued for acceptance based on their juror scores and media category. Approximately 85% of artists will be selected through an open jury process and 15% will be invited by the jurors. The large majority of artists in this show will be established or ‘mid-career’ artists who’ve been selling their work in public forums for 5 years or more. Others will be ‘early stage’ artists who are newer to the world of marketing and selling their work. In an effort to make the show more accessible to these artists, we have developed the Early Stage Artist Program (ESAP) for those who have been selling their work in public forums for 4 years or less. ESAP creates a pathway to show participation and provides the same benefits at a lower cost due to its booth-sharing format. Each large ‘community booth’ will be shared by 6 ESAP artists. ESAP booths are 20’W x 10’D x 8’H and come with electricity, basic lighting, and a display fixture. Each artist will have a dedicated space measuring 4’W x 2’D x 8’H. The center area will be designated as common space. There will be a maximum of 4 such booths – each containing 6 artists – at the show. All eligibility requirements, participation rules, terms and conditions as stated herein apply to ESAP applicants, i.e., the same rules/eligibility/terms & conditions apply to all applicants. Established artists are not eligible for this program. ESAP application is restricted to artists who have been selling work in public forums for no more than 4 years. ESAP applicants must apply as individuals and not as a group. If you qualify to apply for ESAP but prefer a standard booth package, you should select “No” to the application question regarding ESAP and thus apply as a regular/established artist. There are two deadlines to apply to the show: regular deadline April 27 ($35 application fee) and late deadline May 4 ($60 application fee). Artists are asked to submit a total of five (5) digital images - 4 that best represent their work and 1 showing their booth display. Work will be juried based on originality, execution of design, technique and craftsmanship, creative use of materials, and aesthetic qualities. ESAP Applicants: If you've never been in a show before, in the place of the required Booth Shot photo, you may submit an additional photo of your work. Please ensure that the e-mail address you provide is accurate, and that both Juried Arts Services and Art Providence Holiday Show are listed in your e-mail Contacts so that communication from us does not go to Spam. The Art Providence Show strongly encourages both established and early-stage artists to apply. 1. All work must fit within an acceptable media category. Acceptable media categories include: baskets, ceramics, drawing, fiber decorative, fiber wearable, furniture, glass, graphics, jewelry, leather, metal, mixed media, painting, paper, photography, sculpture and wood. All work must be original and made by hand or with the use of appropriate tools. Art Providence encourages one-of-a-kind and limited edition work. 2. No commercial reproductions of any kind are allowed. This includes embellished commercially made objects and works assembled (wholly or in part) from commercially available kits. 3. Artists are accepted for participation must be in attendance at their booth during the entire show. No agent, dealer, or representative may attend in place of the artist. 4. Collaborating artists are permitted, however, any representation other than a true, hands on artistic collaboration is not permitted. Collaborating artists are defined as ‘artists who assist and/or collaborate with the primary artist on their body of work.’ Two artists working on separate bodies of work may not share a booth or a single ESAP space. 5. Artists may only show work in categories selected by the jury. All work exhibited must be of the same body, quality, and category of work that was juried through digital images. Please note: Individual Artists who wish to apply in two different categories must submit two separate applications and application fees. If both bodies of work are accepted, both may be shown. If only one body of work is accepted, only that body of work may be shown. The application fee for the April 27 deadline is $35 (non-refundable). The late application fee for applications received between April 28 and May 4 is $60 (non-refundable). 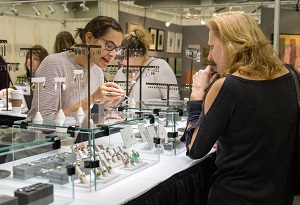 A $25 booth credit will be awarded to accepted artists who exhibited in 2017, to be credited upon payment of 2018 booth fee. Standard package (regular and double-wide booths) fees do not include electricity, WIFI, displays, additional cross bars, floor covering, tables chairs or other furnishings. * Artists may purchase electricity through the RI Convention Center. Other furnishings may be rented through the decorator company. Booth sharing is not permitted in standard booth packages. · Does not include WIFI, floor covering, additional furnishings or ancillary services such as shipping. · 2017’s marketing efforts generated over 2.5 million impressions across print, radio, billboards, and digital. E-mail artprovidenceshow@gmail.com for detailed recap. *Featured areas on the website and full page ad opportunities in the event digital program book will be available at an additional cost. Application Deadline: April 27, 2018 - $35 application fee. Late Application Deadline: May 4, 2018 - $60 ($35 + $25 late application fee). Jury Notification: All applicants who apply through Juried Arts Services will be notified of their status via Juried Art Services. Please make sure to check your JAS profile by May 14, 2018. Booth fees due: Booth fees must be paid in full by June 22, 2018. Artists who submit their request in writing by June 29, 2018 are eligible for a 75% refund of booth fees. Artists who submit their request in writing between June 30, 2018 and October 30, 2018 are eligible for a 50% refund of booth fees. Beginning October 31, 2018, no refunds will be given. Please contact us with questions at artprovidenceshow@gmail.com.